We’d love your help. 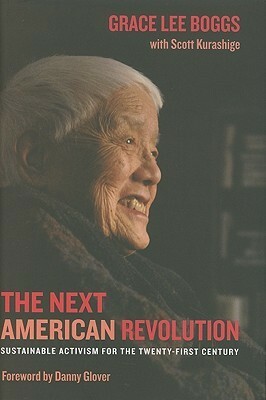 Let us know what’s wrong with this preview of The Next American Revolution by Grace Lee Boggs. To ask other readers questions about The Next American Revolution, please sign up. The next american revolution? Isn't that fanciful? A straightforward account of what we must do and what is already being done to bring about the next American Revolution. This book speaks simply and honestly about the need for a revolution in a society dominated by violence, alienated from nature (as much as itself), and dying from a lack of imagination, compassion, and (principled) action. The great, late Grace Lee Boggs dismisses as obsolete understandings of revolution that demand masculinists surges and seizures of state power. Instead, she A straightforward account of what we must do and what is already being done to bring about the next American Revolution. This book speaks simply and honestly about the need for a revolution in a society dominated by violence, alienated from nature (as much as itself), and dying from a lack of imagination, compassion, and (principled) action. The great, late Grace Lee Boggs dismisses as obsolete understandings of revolution that demand masculinists surges and seizures of state power. Instead, she centers people, and the web of relationships and practices of care we must nurture in order envision and embody our new world. Her essential political framework is that another world is possible. Indeed, as she tells it, it is this deep visioning of other worlds which has been the revolutionary fuel for people committed to putting an end to the triple pillars of racism, materialism, militarism. I find her fundamental analysis and acute sense of how history moves refreshing. Boggs isn't stuck on static notions of social change; she is committed to the practical engagement of our creative capacities. In that vein, she emphasizes the need, as we move, to reflect and, as she puts it, to grow our souls. She talks some about our changing society, where since the 1970's, atleast, we have rapidly moved into a post-industrial phase, marked by neoliberal politics. This fundamental change in political economy demands that we ask new questions. In the flight of factories and the once American dream of stable factory work, increasingly Americans are faced with precarity and insecurity. In this regard, what's true for Americans is and always has been doubly true for Black Americans. As such, her analysis has pushed me to reflect on our shifting time, place and conditions as it pertains to where we work, live, and play. I find some value in her proposal, essentially, that we begin where we are. That is, also, that we begin with who we are. As Grace Lee beautifully expresses it: we are the change we wish to see in the world. For nearly a century, leftists have been fixed on the debate over reform or revolution. The problematic surfaces in the most unexpected places, a recently discussed in an issue of the magazine Jacobin dedicated to the problem of copyleft versus intellectual property. Even Paulo Freire weighed in on the debate at one point in his life, arguing that reform must be seen as a learning opportunity on the road to revolution. Grace Lee Boggs, together with her late husband, radical political thinker Ja For nearly a century, leftists have been fixed on the debate over reform or revolution. The problematic surfaces in the most unexpected places, a recently discussed in an issue of the magazine Jacobin dedicated to the problem of copyleft versus intellectual property. Even Paulo Freire weighed in on the debate at one point in his life, arguing that reform must be seen as a learning opportunity on the road to revolution. Grace Lee Boggs, together with her late husband, radical political thinker James Boggs, has over the years turned our focus to another problematic; the difference between rebellion and revolution. The problem emerged in sharp relief in the wake of the urban uprisings of the 1960s. In Detroit and cities across America, disenfranchisement of the urban poor, mostly communities of color, exploded in violent frustration resulting in massive destruction, death, and new regimes of police command and control. At the time, many radicals sought in the ashes the seeds of revolution. But for the Boggses, the experience clarifies how revolution will never emerge solely from rebellion, resistance, subversion, or protest. As Grace Lee Boggs says in the conversation with Immanuel Wallerstein at the end of The Next American Revolution, protesting a dysfunctional system to become functional will never lead to revolution. As happened in Detroit and cities elsewhere, urban conflagration and the subsequent demand for a functional system gave rise to political opportunists securing theiri own power within the existing system. But what then is revolution? How does our conception of revolution take into account the historical reality of dysfunction as inherent to the system in its waning years? In her clear and accessible language, Boggs describes how everyone wants revolution. We just don't know what it is. The Next American Revolution offers a guide to identifying revolutionary moments and in so doing provides the lens to see revolutionary possibility all around us. It is in a chapter on education (a central concern in Boggs's writings and organizing for many decades) she reminds us of Freire's crucial dictum that revolution involves both denunciation and annunciation. In the current systemic dysfunction, that which needs to be negated is the systems of materialism, militarism, and consumerism. Each has contributed to creating human beings wholly dependent, isolated, and subject to determination by forces and interests beyond human scale and planetary sustainability. In contrast, Boggs writes, Americans in particular must learn to live simply so that others may simply live. In order to ascertain the new revolutionary system that is being called into existence in the present, Boggs asks us to follow the lead of the poor who everyday invent alternatives within a failed system that never meets their needs but only produces greater suffering and fragmentation. The revolutionary potential of those social practices invented by the poor lies precisely in the way they sow the seeds for new understandings of human community; self-determined, self-reliant, and grounded in cooperation. To denounce the failed systems we have without acknowledging and joining in solidarity with the alternatives arising all around us in the creativity and dignity of the poor, we will never have the people power to match forces with those whose notion of revolution is to conserve the accumulation of wealth. There can be no popular movement unless people see prefigured today the possibility of an alternative to the massification produced by the system we presently have. In this sense, Boggs emphatically rejects the vanguardism and mass politics of an older notion of revolutionary politics (one that we see celebrated in the recent Hollywood film series, "The Hunger Games"). Speaking from her own experience of decades of activism within numerous revolutionary tendencies, Boggs describes the hierarchical and dehumanizing aspects of the old concepts of revolution as merely mirroring the capitalist system. In themselves, they offer no revolutionary alternative. Reading The Next American Revolution profoundly makes the possibility of systemic transformation appear human-sized. At the same time, Boggs's analysis produces its own contradictions that require patient and creative reading. Written on the eve of Obama's first inauguration, The Next American Revolution speaks often and buoyantly about his rise to power and the role of a mass movement in ensuring his election. Even when she is clear that the radical potential in Obama's presidency rests in the desire for transformative change among the millions who volunteered on his behalf, the book communicates little historical memory that such moments have occurred often only to result in profound disillusionment and cynicism. Boggs's focus, however, is on the ground; how a movement seeking "change we can believe in" is the first step in taking responsibility to make that change in our lives. Elsewhere in The Next American Revolution, Boggs sharply warns that a test for any revolutionary project lies in its break from dependency on the Federal government. At one point, Boggs states sharply that demands for benevolent action and justice from the state on behalf of the poor always arises out a sense of one's own victimization. Empowerment begins with self-determination not with demands that the state function on behalf of the poor. This seems like uncharacteristically, for Boggs, non-dialectical thinking. Also unclear, however, in Boggs's prognosis is how self-determination prepares communities for inevitable backlash that will come from the state and, in particular, from the police who rarely passively accept their obsolescence. Importantly, Boggs harbors little naïvete about the likelihood of backlash. As she says in the book's final pages, it is precisely due to racist backlash (e.g. Tea Party extremism) that the poor must pursue their own inter-dependence and self-determination. But with everything to lose, the forces of reaction (including the capitalist classes and their allies) will not simply whither away in the night as we're seeing now in the Canadian government's brutal retaliation against First Nations communities daring to live by their own environmental policies. That all said, the fact that Boggs brings us to this point in our political thinking and questioning itself testifies to the profound insights that she has to offer. Early in the book, Boggs sites science philosopher Margaret Wheatley in arguing that revolutionary change is not produced by critical mass but through critical connections. The Next American Revolution has the exhilarating effect of catalyzing those connections through the ideas and lived experience of its nearly 100-year old author. No-one alive today more than Grace Lee Boggs embodies the history and disappointments of the Twentieth-Century Leftist struggle. As The Next American Revolution attests, no-one more than Boggs embodies optimism for a new Century of experimentation and bold action. It is because of the lessons from the past that we know our task today. For its simple language and equally complex ideas born out of decades of experience in the struggle, Bogg's The Next American Revolution is probably one of the most important books written in a generation. Even in its contradictions, it can only help readers in the work of transformative change. I will certainly be recommending this book to other members of my own political collective as well as the many activists, artists, educators, and organizers I encounter everyday who have made the commitment to becoming the future we're all waiting for -- and urgently need. I appreciate the compassionate approach to activism taken by Grace Lee Boggs. So much more productive to focus on what can be accomplished than to get dragged down by opposition. The missing link for me, however, was the economic component. I understand that Dr. Boggs wants us to get beyond our environmentally damaging, soul sucking focus on getting more stuff. At the same time, the reality we live in requires that we earn money to afford safe housing and provide us with adequate healthy food an I appreciate the compassionate approach to activism taken by Grace Lee Boggs. So much more productive to focus on what can be accomplished than to get dragged down by opposition. The missing link for me, however, was the economic component. I understand that Dr. Boggs wants us to get beyond our environmentally damaging, soul sucking focus on getting more stuff. At the same time, the reality we live in requires that we earn money to afford safe housing and provide us with adequate healthy food and other necessities. There is a substantial segment of the population whose wages are so low that, even with full-time work, they still qualify and need food stamps to feed their families. While the movement to grow our own food, as discussed in her Detroit urban farms chapter, is laudable and will provide fresh produce for those involved in the community gardens and urban farms, not everyone has the time or inclination to grow their own food. Plus where is the incentive to motivate those who consume the most to make do with less? A more equitable distribution of wealth would go a lot further to solve our hunger issues than building more gardens. Plus, if we consider community to be the larger community of states and nation, we would hope for a more sustainable food system that can healthfully feed our nation so that the non-agriculturally inclined can earn a suitable living providing goods and services that creatively serve us. For something truly revolutionary, we need to think beyond returning to a more agrarian way of life. I’m interested in hearing more ideas that would motivate all segments of our society, especially those who consume at the highest levels, to move away from our consumer-focused model to more creative and profitable ways to contribute to a more sustainable national community. This book is amazing! Grace Lee Boggs is so incredibly inspiring and redefines what it means to be revolutionary. This is a book I will read over and over and over again and quote for the rest of my life. I recommend it to anyone and everyone, especially if you are at all interested in social justice issues. This book is basically a soul burrito. You can't smash the system with a burrito, but you can eat it, and be sustained a bit longer. And that's an important part of "working out a strategy that combines a short-run, immediate attempt to solve people's needs and a medium-run strategy of transforming the system" (p. 197). You can try to do one or the other, but things work out best when you do both at once. I learned about GLB from a PBS special (filmed by Grace Lee of the Grace Lee project, FWIW). This book is basically a soul burrito. You can't smash the system with a burrito, but you can eat it, and be sustained a bit longer. And that's an important part of "working out a strategy that combines a short-run, immediate attempt to solve people's needs and a medium-run strategy of transforming the system" (p. 197). You can try to do one or the other, but things work out best when you do both at once. I learned about GLB from a PBS special (filmed by Grace Lee of the Grace Lee project, FWIW). In that documentary, as in this book, what grabs you most about GLB is her quiet optimism. She is a dreamer where I and so many others, in this age, feel as if we are being devoured by our pessimism. But where some dreamers get caught up in their dogma or righteousness and become isolated from reality, she comes across as someone who is constantly questioning and refining her ideas in conversation with others. GLB compels me because this combination - someone who has this capacity to dream, intellectually analyze and develop that dream over time, AND then translate that into direct action, always attempting to integrate these three parts - is what I'd like to become. I have been waiting for this book all my life. At last, a revolutionary vision that makes sense! Not a bunch of violent macho extremism or ideological puritanism - just a great deal of creative thinking and common sense, distilled over a long lifetime of radical activism (and wide reading). The book came out in 2011, and it is heartbreaking to read in 2018. The things she says about W's administration were certainly true, but they also sound like what we are living through now, only W's administr I have been waiting for this book all my life. At last, a revolutionary vision that makes sense! Not a bunch of violent macho extremism or ideological puritanism - just a great deal of creative thinking and common sense, distilled over a long lifetime of radical activism (and wide reading). The book came out in 2011, and it is heartbreaking to read in 2018. The things she says about W's administration were certainly true, but they also sound like what we are living through now, only W's administration looks like the Good Ol' Days by comparison. She was very clear-eyed about Obama, too, reminding us what he said about the need for us to make the change we needed. Instead, we fell into the usual complacency that Our Hero would take care of everything (whether the hero was Obama, Bernie, or Hillary), and now we hope it's not too late to save our country and the world from the horrifying results. I hope the midterms will mark the start of our path back to sanity, so we can take up the work that this book sets out for us. A blast of hope in trying times. Highly recommended reading for anyone despairing over our tremendous social problems, inequalities, endless war, environmental destruction, institutionalized racism, broken education system. Read this if you're wondering how the world can possibly change. Are we screwed? Maybe, but maybe not. "Another world is possible." I haven't read a book that made me think & reflect about society and life in a very long time. Grace Lee Boggs will be missed. RIP. This review has been hidden because it contains spoilers. To view it, click here. An intellectual and a grassroots social activist. I learned even more about how MLK and Malcolm X influenced the civil rights movement and other social justice movements of the past. Where would we be today if they had lived long, full lives doing the good work that they did? Making positive change is a continuous struggle and Grace is right that we do need a paradigm shift before real change can happen. It's happening slowly, I think, and there are positive movements in the right direction. Slo An intellectual and a grassroots social activist. I learned even more about how MLK and Malcolm X influenced the civil rights movement and other social justice movements of the past. Where would we be today if they had lived long, full lives doing the good work that they did? Making positive change is a continuous struggle and Grace is right that we do need a paradigm shift before real change can happen. It's happening slowly, I think, and there are positive movements in the right direction. Slower than we'd like to see, however. But we will continue. Grace Lee Boggs is a radical American social activist, philosopher and feminist who has written many books, and pioneered many initiatives in her home town of Detroit. In the 1940s and 1950s she worked closely with Marxist leaders in the US, but in the 1960s she and her husband Jimmy Boggs created their own political direction which Grace continued until the end of her life in 2015. Grace Lee Boggs, of Chinese-American descent, was actively involved in the Black Power movement with her husband. I Grace Lee Boggs is a radical American social activist, philosopher and feminist who has written many books, and pioneered many initiatives in her home town of Detroit. In the 1940s and 1950s she worked closely with Marxist leaders in the US, but in the 1960s she and her husband Jimmy Boggs created their own political direction which Grace continued until the end of her life in 2015. Grace Lee Boggs, of Chinese-American descent, was actively involved in the Black Power movement with her husband. In The Next American Revolution: Sustainable Activism for the Twenty-First Century, Grace Lee Boggs final work in 2011, she takes us through her theoretical political journey- beginning as a Marxist and moving to Detroit to get involved in the workers movement, but over time becoming more anarchistic and creating her own vision of the future. In addition to questioning the meaning of work, Boggs speaks about the difference between rebellions and revolutions throughout the book, citing many social justice leaders along with adding her own thoughts. She quotes Paulo Freire in that people “cannot enter the struggle as objects in order to later become human beings.” Stressing communal learning as well as valuing individuals, Boggs questions our public schools system, and imagines a different future. “Our schools have been in a continuing crisis because so few educators are able to or willing to take the risk of leaving behind the old factory model and creating a new one that meets the human and social needs of young people to be creators of knowledge and social change,” Boggs writes. “The movements of the sixties, I noted, were led mostly by men coming out of patriarchal culture. So there was a lot of top down vertical leadership… However, since discovering that the personal is political, women activists have been abandoning the charismatic male, vertical, and vanguard party leadership patterns of the 1960s and creating more participatory, empowering, and horizontal kinds of leadership. Instead of modeling their organizations on the lives of men outside the home… they are beginning to model it on the love, caring, healing, and patience that, along with an appreciation of diversity and of strengths and weaknesses, go into the raising of a family,” Boggs writes. Grace Lee Boggs asks us to become leaders in our own destiny, and asks us to dream big and work hard toward those dreams. Her work did not center on what was easy, but what was necessary for a society which respected all human life, and maximized human potential. I set this book down for almost a year after I was half way in. It's fairly intense, but really lovely. I purchased it because I knew I would enjoy her perspective on the needed revolution. She uses the evolving political ideas of Gandhi, Malcolm X and Martin Luther King to demonstrate the importance of adapting your politics to the changing times. Her message is that we need to create positive alternatives to the state structure instead of rallying against it. She repeatedly addresses how our so I set this book down for almost a year after I was half way in. It's fairly intense, but really lovely. I purchased it because I knew I would enjoy her perspective on the needed revolution. She uses the evolving political ideas of Gandhi, Malcolm X and Martin Luther King to demonstrate the importance of adapting your politics to the changing times. Her message is that we need to create positive alternatives to the state structure instead of rallying against it. She repeatedly addresses how our society values objects over people, and that revolution comes from creating community and helping people to create self-change so that there can be systemic change. She also delves into the issues with public education, in that students are in a factory of memorization instead of engaging with the community to make that knowledge real and applicable. As a teacher, that chapter made me laugh, cry and just generally talk aloud to myself. Finally, her point is that we need to create positive constructive change on the local personal community based level instead of fighting against big institutions via large organizations. We need to help change our own lives and the lives of those in our communities by creating alternative sustainable solutions so that we are not reliant on the power structures we so disagree with. From someone who has participated in various movements (civil rights, anti-war, and strengthening community during deindustrialization), the words are heavy with knowledge and emotion. GLB has a PhD in philosophy from Bryn Mawr (140). p.29 - "[A]re we prepared to develop a whole new form of solidarity economics emphasizing sustainability, mutuality, and local self reliance?" p.64 - six failed axioms of revolutionarie since the French Revolution. p.71 - "The revolution to be made in the United States will be the first revolution in history to require the masses to make material sacrifices rather than to acquire more material things. We must give up many of the things which this co GLB has a PhD in philosophy from Bryn Mawr (140). p.71 - "The revolution to be made in the United States will be the first revolution in history to require the masses to make material sacrifices rather than to acquire more material things. We must give up many of the things which this country has enjoyed at the expense of damning over one-third of the world into a state of underdevelopment, ignorance, disease, and early death." p.110 - "Instead of investing our hopes in GM, Ford, and Chrysler and becoming increasingly alienated from each other and the Earth, we need to invest in, work with, and rely on each other." p.132 - Mara Mies & Veronika Bennholdt-Thomsen "The subsistence perspective"
p.132- Mara Mies & Grace Lee Boggs, "Another World is Necessary, Another World is Possible, Another World Has Already Begun"
p.146 - Gandhi: "An intellect that is developed through the medium of socially useful labour will be an instrument for service and will not easily be led astray or fall into devious paths." p.148 - "Freire, "Pedagogy of the Oppressed"
This book is engaging and fun to read but for some reason it's not very memorable. I am amazed by Grace Lee Boggs and so much of the content of this book is affirming and powerful. But as I read it, it feels like the words run through my fingers. For some reason, it just doesn't stick. There are great sections about King, Gandhi, Love, Beloved Community, and the power of the people. I also love the way she emphasizes our need to grow souls. reflecting on the ways of working in the 60s: "Our meetin This book is engaging and fun to read but for some reason it's not very memorable. I am amazed by Grace Lee Boggs and so much of the content of this book is affirming and powerful. But as I read it, it feels like the words run through my fingers. For some reason, it just doesn't stick. I first hear of Grace on a PBS Point of View Biography video documented by one of Grace's "students." It was so captivating, I researched her and bought her book. Such a serendipitous occasion. I watched the video again by streaming the website which has since replaced it. It can be purchased however: http://www.shoppbs.org/product/index..... It was the perfect introduction to this amazing woman. She has the never ending enthusiasm for all that activist means and methods that produce real change I first hear of Grace on a PBS Point of View Biography video documented by one of Grace's "students." It was so captivating, I researched her and bought her book. Such a serendipitous occasion. I watched the video again by streaming the website which has since replaced it. It can be purchased however: http://www.shoppbs.org/product/index..... It was the perfect introduction to this amazing woman. She has the never ending enthusiasm for all that activist means and methods that produce real change and affects real lives. Beyond the power revolutions and outcry for "change," Grace answers the question where do you go from here? She begins with the history of philosophical thinkers and activists from the early 20th Century through the African American struggles for civil rights to Black Power demands for control in the mid-20th Century to the vision for new societal change that will fulfill the revolutions of the past. Amazingly easy to read and relate to, Grace brings the intellect, experience and wisdom all her years (she is 99) can offer to this book. It is very powerful in that light. One of a couple of the most important books I've ever read, hands down. Read it, and allow yourself to be challenged by the question of what we mean we talk about "revolution." At 100 years old this year (2015), Grace draws on a powerhouse of both lived experience as a movement activist (including close work w/Malcolm X, organizing rallies in Detroit for Dr. King, etc.) and study as someone who was able to get her PhD as a Chinese American woman in 1940 (at points producing some of the first Eng One of a couple of the most important books I've ever read, hands down. Read it, and allow yourself to be challenged by the question of what we mean we talk about "revolution." At 100 years old this year (2015), Grace draws on a powerhouse of both lived experience as a movement activist (including close work w/Malcolm X, organizing rallies in Detroit for Dr. King, etc.) and study as someone who was able to get her PhD as a Chinese American woman in 1940 (at points producing some of the first English translations of Marx's early works, the "Economic & Philosophic Manuscripts of 1843-1844"). This is a really important book. It doesn't fit comfortably with academic conventions, but it is a good opportunity to recognize that not everything really-super-important and worth reading follows the current approved conventions of academic discourse (unconventional strategic use of capitalization - gasp! - for instance). What this book suggests, perhaps most profoundly, is that we need to imagine alternatives outside the current standard cures for poverty and urban decay. Assumptions about political fixes such as redevelopment and full employment get a good challenge here; it also rescues the idea of values from the far right. This book moves us forward. This is especially important at a time when our imagination for the possible seems to be shrinking. I quit this about one-third of the way through. She makes great points about the future of America, capitalism, and the necessity of change, but the entire thing is delivered in the manner of an inspirational commencement address. Yes we need to organize, yes the government has shorted the poor... but how? Do you have examples of things that have or are working? Or is it a call to arms to hold a protest sign and raise awareness. The book is big on high-minded concepts that sound good on paper but I quit this about one-third of the way through. She makes great points about the future of America, capitalism, and the necessity of change, but the entire thing is delivered in the manner of an inspirational commencement address. Yes we need to organize, yes the government has shorted the poor... but how? Do you have examples of things that have or are working? Or is it a call to arms to hold a protest sign and raise awareness. if your looking for a place to start reading about how to build a new world then consider staying with this book to inspire you. Pleasant read from a truly unique and inspiring individual but for me, the analysis and plans that the book elucidates felt a bit simplistic. While I appreciate and agree with the content I was hoping for a more detailed account. The stories she shares and the various activists that she cites are a start but that's all.